Desiring but another day to ebb the pull, damn the flow and spend an evening wading creeks that meander. There is ‘FOOD FOR THOUGHT’ but what about ‘FOOD FOR MEMORIES’? This morning, I dropped my granddaughter, Bug, off in Gadsden. She was with me for two evenings and a day. I am specific about the time, because the time is so precious –Every Minute Counts. I listened. And realized that when Bug said she wanted to cook dinner, and wanted to bake a pumpkin pie that that was exactly what she meant. It was really how she wanted to spend our time together. Though we have often baked together, we have never prepared and cooked an entire meal. So, I explained it would take up a great deal of our day. Bug said she didn’t care and got busy creating the menu: BBQ chicken, (No surprise there. I remember when she was four and decided it was to be breakfast; and it was. ), mashed potatoes, fresh green beans, and garlic/cheese biscuits. And, let’s not forget the pumpkin pie. And you see, it was with the pumpkin pie that I almost messed up. I almost acted like an adult and suggest a more seasonally appropriate dessert. You know –lemon icebox, key lime or a cobbler. Thank goodness I paused and realized this was not about food, this was all about her –and she had suggested pumpkin because it was what she had set her heart on! The kid knocked dinner out of the park! It was amazing. But, it was the time we spent together snapping the beans, peeling the potatoes, and baking the pie that I will never forget. I hope she doesn’t either. It was simple, and it was sweet -a summer memory wrapped up in preparing and enjoying a meal together. The second part of the Romania lecture on WE SHARE THE SAME SKY was to expound how WE tie our memories to emotions; emotions that are most often linked to people, places and food. Because I’ve opened by sharing the recent cooking experience with Bug, I will skip the introduction and jump to the excerpt. Last year, when I began planning this trip, I purchased three guide books of the city. While mapping out Chinatown, I was surprised to find that there are almost 300 restaurants within the neighborhood’s boundaries. Some sounded better than others, and although I had my list of wants written out well before I left home, I have found that once I get into an area several things tend to dictate choice. The first two are my mood, and the prolific bragging of locals. Often as not, however, I choose a place to dine based on nothing more than the way a place feels. Today, I am looking for an eatery called Sweet-n-Tart Cafe. My new friend Karen suggested I try the congee, a type of rice porridge. In the South, there is a particular fondness for a dessert that is also considered a staple. In our home that staple was rice pudding. It ranked right up there with the various biscuit topped cobblers: blackberry, peach or sweet potato. Rice pudding even held its own at the table when presented along with butter pound cake. All these family recipes were handed down over the years. Along the way, others crept in. Some were come across accidently and yet others long searched for -like the recipe for Lillian Carter’s Peanut Butter Pound Cake. Rice pudding back home is a buttery, dense pudding loaded with vanilla, sugar and a pinch of cinnamon. The overall consistency can be described as velvety. Usually it arrives at the table crusted with a browned sugar and butter topping. It is wonderful hot from the oven, at room temperature and even straight from the fridge, ice cold. Like banana nut bread, rice pudding is a staple breakfast food as often as it is dessert. During my childhood, rice pudding appeared most often when times were lean. Those were the days when a summer evening meal consisted of fresh scrubbed vegetables from the garden and fish from the trotline. Lean dinners in the winter were often bowls of pintos and cornbread or skillet fried potatoes with onions. As the seasons changed, fish gave way to game: fried dove or quail with gravy, braised rabbit, smoked turkey or venison. All of these could be taken within a five-mile radius of our home. The variety may not have been great, but there was usually plenty. Biscuits with butter, cornbread with sorghum, molasses or honey -these were present at almost every meal. Other times, they were the meal. More staples. How often I sat at the kitchen table during the late evening with Grandpa, feasting on only this and black coffee. I wish I could remember the things we talked about and the stories he told as clearly as I remember the food. Just as there was always Grace before dinner in one grandparent’s house, there were always stories in the other. Rice pudding, however, was common at both dinner tables. Cash Only is posted on the door to the tiny restaurant. As of yet, this has been the hardest adjustment I’ve had to make in the city. Thank goodness the guidebooks warn tourist up-front. If not, it would probably be as close as you could get to having a Southern woman in true distress. At the counter, I order the Congee with Hong Dou. “Good for you,” says the man nodding his approval and making a circular motion with his hand around the stomach. “Thank you,” I tell him. It is all I know to say. Congee is made by cooking rice with water until it breaks down into a porridge- like consistency. It is usually flavored one of two ways: salty and robust with flavorful meat, or glutinous and sweet with red beans, dates and palm sugar. I am in want of the latter. The congee arrives and the serving is more than I anticipated. It is a meal and has the wet consistency of porridge rather than the thickness I associate with rice or bread pudding which, when scooped, holds together. I have to admit to being somewhat put-off by the addition of beans. Trying it though, I am pleased and notice a chewiness that regular rice pudding does not have. It is warm, sweet and heavy, very much a comfort food. Admittedly, it is probably healthier than the rice pudding I grew up on because it is cooked without butter and cream. melding with the constant movement of the masses that is tranceinducing. pleasure in the sheer beauty of the place. I browse the children’s section and try to find a gift for the kids. she set aside especially for me. reason, gifted storytellers are held in much esteem in our region. acquired with time and knowledge. that Mother would use to get me to behave during church services. when I rolled over to say my prayers, I realized I couldn’t. The following Sunday I returned it to the library and apologized. with Ricardo Montalbán who was on TV. mother came into the room, walked to the table and sat down with us. She asked if I would make her a sandwich. being nice. Besides, she couldn’t fuss with a full-mouth. beliefs and issues from each, I could not agree with all from either. land for our new home and we moved from our small neigh-borhood out into the country. to Alaska. But, our common, once shared love of books continued. during the twenties, engulfed in the bustle of gay nightlife! their famous store-front windows were decorated for Christmas. Basement Level, I find the beauty department and perfume. beds; auburn locks tucked beneath a wide brimmed straw hat. and orange have me walking away wanting. food and so hail a taxi to Lower East Side. Katz’s Delicatessen opened in the Lower East Side in 1888. I tell him, not just being polite. many valuable memories I have lost along the way. So many I am sure. peas, pintos, or stew. Liver is a delicious exception. an agreement may not be reached any time soon. them to the waiter who lingers, as if searching for something to say. sandwich, I head back out into the streets, southward again. The streets become more brilliant in color, and heavy with scent. about within tattered baskets, hapless, oblivious to their demise. because you side-step something strewn across every curb. county farmer’s Co-Op where planters purchase feed and seed. One could teach science from this shop or Macbeth! will reduce one’s allergic reactions during hay fever season. is Southern Elderberry wine made from the plant’s delectable fruit. in rural life is that if you don’t prepare it yourself, you don’t eat it. nothing more than the way a place feels. new friend Karen suggested I try the congee, a type of rice porridge. also considered a staple. In our home that staple was rice pudding. as often as it is dessert. almost every meal. Other times, they were the meal. More staples. other. Rice pudding, however, was common at both dinner tables. making a circular motion with his hand around the stomach. with red beans, dates and palm sugar. I am in want of the latter. The congee arrives and the serving is more than I anticipated. is cooked without butter and cream. so many people out and about. It is hard to get used to. cookies, pay and walk back out into the crowds. and inadvertently my needs are filled. lie between us, between the layers we create together –this is life! the seasons, the stages of life. longingly for the person I used to be? look so severely upon myself. Nor, did I fret over the actions of others. Every day was looked forward to. immense disappointment I feel, the anger or even the resentment. on the positive –I am healthy. My children are healthy and happy. I have wonderful parents, a brother and sister-in-law and nephews. have had two good days. I will have another tomorrow. I will be o.k. This feeling will not last; the bad passes just as quickly as the good. It only seems to remain longer. unknowingly packed and so I begin to read and reflect on it as well. too close. Clarity comes with distance and time. 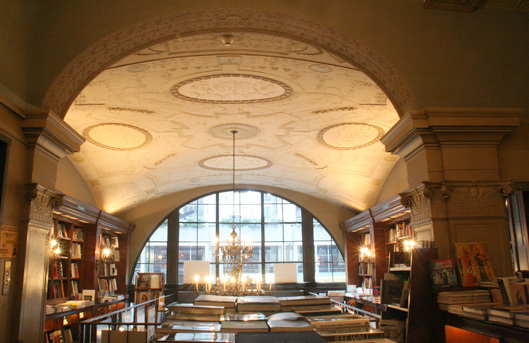 *Note 57th Street’s Rizzoli Bookstore was demolished; the domed ceilings, woodwork, chandeliers –all of it, gone. My son, the wise one. …And, so, I find myself standing under the eaves of some back street, wet, caught between the easy banter of old men. there is the tearing with teeth to consider~ ’tis the season for SLICE! Avondale, Alabama ~ soul food & country haute cuisine, wood-fired pizza at the P.O. & suds @ a microbrewery!